On Tuesday afternoon the Chicago Blackhawks made an announcement we all knew was coming. Hall of Famer Stan Mikita has died. The fact that the news was inevitable doesn’t make it any less heartbreaking. Mikita is – still – the greatest player to ever wear the Blackhawks sweater. He defined the franchise well beyond the generation in which he played. He was a legend, pioneer and tremendous ambassador for the game. On October 19, 1980, Mikita became the first Blackhawks player to have his number retired by the organization. “Stosh” played 1,394 regular season games for the Blackhawks between 1958-59 and 1979-80, a number that still ranks eighth in NHL history for games played with a single organization. Of the seven players with more games played in a single sweater, four – Nicklas Lidstrom (DET), Ray Bourque (BOS), Steve Yzerman (DET) and Mike Modano (MIN/DAL) – began and finished their careers after Mikita stepped away. Only three Red Wings – Lidstrom, Alex Delvecchio and Yzerman – have played more games while wearing only one sweater their entire career. Mikita scored 541 goals and posted 926 assists. Only six players in NHL history have accumulated more points for one franchise than Mikita’s 1,467 for Chicago: Gordie Howe (DET), Yzerman, Mario Lemieux (PIT), Wayne Gretzky (EDM), Joe Sakic (QUE/COL) and Bourque. Of those six, only Yzerman, Lemieux and Sakic player their entire careers for one franchise. Mikita played his entire 22-year career with the Blackhawks and led the team to the 1961 Stanley Cup. 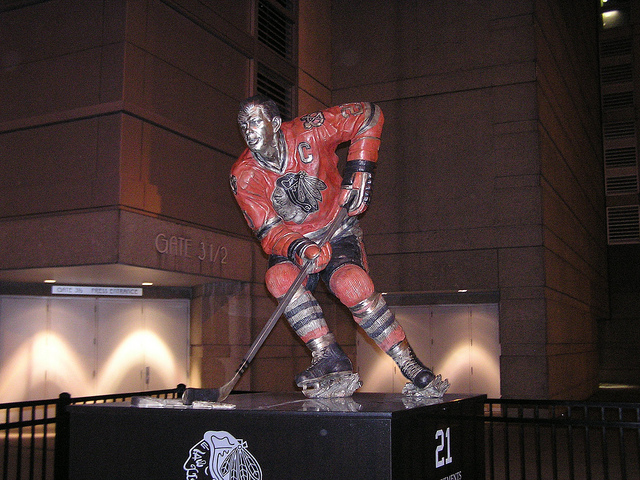 A four-time Art Ross Trophy winner (1964, 1965, 1967, 1968) as the National Hockey League’s leading scorer, Mikita is the Blackhawks all-time franchise leader in points (1,467) and games played (1,394). He is second in franchise history in goals with 541. Mikita also was awarded the Hart Memorial Trophy as the Most Valuable Player in the NHL and Lady Byng Memorial Trophy for sportsmanlike conduct in 1967 and 1968. Rest in peace Stosh! He was one of my childhood heroes. True Phil a real hero. One my favorite players growing up. My goodness there are not enough words to express what Stosh meant to this city, he put the Blackhawks in another stratosphere. He’s the reason my Dad got into hockey, and thus why we are all Blackhawk fans. I had the good fortune to meet and talk with him at a charity golf event in 2002 and he spoke with me as if I was family. I have always treasured that conversation, and wish the Mikita family peace. I just got goats and named one Stosh. Great ambassador for the not only the warrior head but the city as well. When I was a kid, nobody had team jerseys, I don’t think they even sold them. But if we got to pick a jersey number for sports I always asked for 21. I last put 21 on my intramural jersey in college and one buddy, also from the Greater Chicagoland Area, got it. Was everything that a Blackhawk represented. Stan the man. So sad, but the last few years have been hard so I’m happy for him that he doesn’t have to endure any more. Some posters will already know this, but many won’t. In 1972, Team Canada played the Soviets in the 8 game Summit Series, arguably the greatest hockey matchup ever. Stan was on TC but a couple of years past his prime and Canada was stacked at centre so he only got in a couple of games. After the series was over, Canada played an exhibition game in Prague. Stan (his last name at birth was Gvoth) had left Czechoslovakia for Canada when he was 14 speaking no English (Mikita was his uncle’s name). When he returned to play hockey it was as captain of Canada and his folks were in the crowd. That was my favorite Mikita memory – way larger than just a game. RIP. Although I am very sad that he is gone, he did not deserve to suffer any longer. 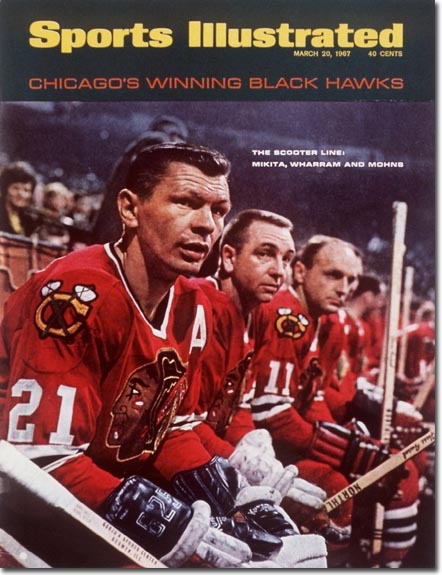 I hope that Stan and Keith and the rest of the past Hawks are lacing them up in hockey heaven. Was fortunate to attend one game during ’61 finals & cheered my 12 year old heart out. A few months later, sitting at a bar with my dad after a little league game (yes, sitting at the bar, things were different back then) this guy sits down next to me and starts talking with us like we are family. Only later did I find out Mr. Mikita was THAT Mr. Mikita!!! Fast forward 25+ years, sitting in the old stadium and a guy in front of me turns around and says, “I know you, you’re little Bill.” Amazing human being!! In addition to being the greatest Blackhawk player ever, he’s the only player in NHL history to win both Hart & Lady Bing trophies in same year – and he did it twice in a row!! Amazing talent!!! I was privileged to see him play. He had great skills and was tough as nails. RIP Stan and God bless your family!! during his junior days with the Teepees. He was a legend in these parts! RIP Stosh! You were an inspiration to us all. A true Blackhawk! 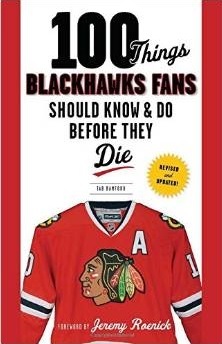 I did not become a real hockey fan until I moved to Chicago in 1989. 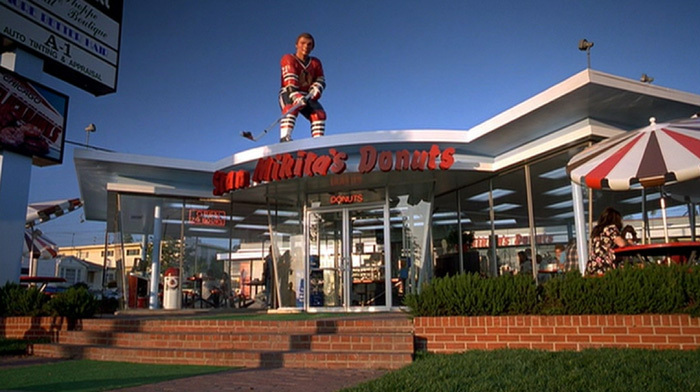 However, I definitely knew who Stan Mikita was before then. Watching him as an Ambassador and listening to him speak, it was obvious that he was a class act. I remember well the unveiling of the statues of him and Hull, and how eloquently he spoke that evening. Best wishes to his family. He is well, I’m sure. @CBH ROB: good post. No draft back then. To correct my earlier post, Stan came to Canada at 8. Rest in peace Stan. Thank you for all good years and memories. There was much to admire about you on and off the ice but the thing that stands out most to me was your sense of humor. A great life lived. Good memory Jordyhawk forgot all about that. A true legend, a hero and a gentleman. Like Bobby Hull, always signed autographs with a smile unlike some players today who barely make eye contact. Grew up idolizing Stan and Bobby! My sincere sympathies to the Mikita family! 21 forever rest in peace! RIP. Wish I had a chance to watch the man play the game. I saw Stan play many times at the Stadium, and we saw him often as kids in our neighborhood (Hillside Il.) as he lived in our Working Class neighborhood. Times have sure changed. Thanks Stan, you were the greatest of all Blackhawks. He was still effective very late in his career with some garbage Hawks’ teams. (Tony O stood on his head many a night as well). His back gave out or he could have played even longer. It was a shame that terrible disease afflicted him. May God rest his soul. I can almost see my bedroom in the late 60’s/early 70’s-poster of Mikita, Butkas, Orr and Bench-my childhood heroes -time keeps moving fast. Hopefully a sense of peace for the family. Mikita is the Earnhardt of Hockey. I began following hockey in ’65 and Stosh was always my favorite Blackhawk. He was one of the craftiest stickhandlers and surprised goalies with his sudden powerful release. When his ear was sliced almost in half by a stick, he came back wearing a helmut and his Scooter Line (Warrem and Mohns) joined him for the remainder of their careers. Can you believe that wearing a helmut in those days was unusual? Such a class act. Unselfish team player. Wasn’t a complainer. Gave back to the community with appearances and raising money for charity. Among a small group of very elite Chicago sports legends. And now 21 belongs to the ages. One of the things about Stan in Chicagoland is that of all the sports people we followed and admired, Stan was more like us, it seemed, than the others. My uncle Walter was a doctor and owned a home in Elmhurst in the 60’s. One night shortly after he had become a young MD Walter ended up in the Blackhawks dressing room stitching up a player. This began a long association with the team and numerous players. Mikita and Walter were neighbors in Elmhurst, about the same age, wives and kids about the same age. They were friends. Of course Stan was my hero, as was Bobby, but Stan was like family and Bobby was more like Mickey Mantle. When 9 left town Stan filled the void and his stature grew. Memories. The golden tones of Lloyd Pettit over the radio in a darkened kid’s room so vividly made alive by what Stosh was doing on the ice. Verdi said Mikita “could stickhandle through a car wash and not get wet”. It is so. One very hot summer day when I was about 10 years old we show up at my uncle’s house. My Aunt Jeannie (God bless her) says “Your uncle is waiting for you in the den”. I mope down the hall as if I’m in trouble and go in. Uncle Walter is sitting there with three other guys. Instantly I recognize Stan, even through his summer mustache (it looked great on him!). Next to him were Kenny Wharram and Pit Martin. They had just returned from the golf course and were well into their beers, frosty mugs of which were quickly set aside when the kid walked in. I got my hair tussled and some how ‘ya doings and also heard some wisecracking between them which I didn’t understand at the time but it sure was special to laugh with those men. I was ten feet tall that day. Some terrific words posted here to honor the memory of Stanley. Thanks to you all for sharing your thoughts and memories of one of the all time greats. Special stuff for a special guy! While kids grew up in the 90’s wanting to be like Mike, when I was a kid in the early 60’s I wanted to be like Stan! Rest in peace Stan , bless your family , very sad day . They don`t make em like Stan any more . You will be missed . I first meet Stan in the fall of ’61. I was on my high school track team and could start my workout sixth period. Morton West has an indoor track. Back then pro athletes had to find their own work our facilities. I came out and there was this young fellow in plan gray sweats no markings doing laps. I thought he was a college kid working out for some college. I jugged up to him and asked what track team he was on. He said no track team hockey he was “Hoping to make the Blackhawks!” I asked what poison? He answered “Center” I said “You know this is Berwyn, Stan Mikita territory”. Back then Berwyn was primarily Check. That my favorite player was Stosh #21. I told him that he would make the team and how about giving me his name and number so I could follow him? He turned and looked at me and said, “Stan Mikita 21”. I came to an instant stop. He looked at me and said “Kid are you going to just stand there, come on”. He asked me what I want to be and I said a civil engineer. Aaa, numbers that was the only think he was good at in school when he first came to Canada. After that whenever he saw me he would point smile and say, “Stan Mikita’s number one fan”. He always made me feel good. I would go on to a small engineering school in the UP. We have a division one hockey team and back then it was dam good. Friday night my seat was right behind the visitor’s bench and I got to meet many of the players, some made it to the NHL including the Hawks. Meeting Stosh that afternoon will always be the best ever. As a youngster the 150 miles between our family’s home and the Stadium might as well have been 150,000. Getting there was simply not attainable back then. Fortunately my Dad was promoted and assigned a new position at work which would require him to visit the World Book offices in Chicago from time to time. While I was never a passenger on those business trips, I did benefit from the things he would bring back from the big city up north. None more so than the morning I awoke to 2 souvenirs from a Blackhawks game he attended courtesy of WB. It was 1974 and he had returned home with a large button proclaiming it was ”Stan Mikita Night”. That button and a simple plastic light switch cover, with a full color Indian head logo, strongly cemented a lifelong love affair with #21 and Chicago’s NHL team. Stan Mikita, may you forever rest in peace. These special stories/memories. Makes you proud. How he makes people feel. How good is that, mate. Special stories/memories. Makes you proud. Not just a top 100 player. Your allowed to repeat that without edit. Hello fellow Hawk fans. My first comment here. Been a lurker since 2010. In the early 1960s WGN began televising select Hawks road games, maybe 12-15 per season. As a 4 year old in Stevensville, MI I remember watching with my dad. The announcer, Lloyd Pettit, seemed to always say the word “Mikita” whenever the puck was on our black and white screen. 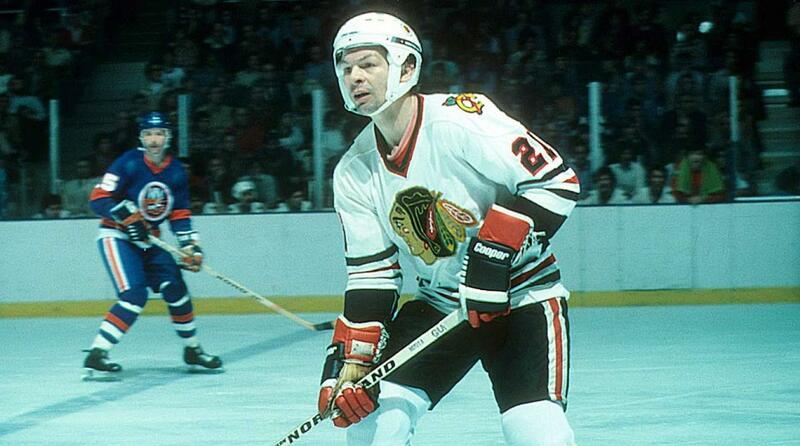 So my first memory of Blackhawks hockey is that I thought the puck was called a “Mikita”! My dad told me the difference soon enough. I met Stan for the first time a few years later (September, 1970) in South Bend, IN when the Hawks used to play an annual exhibition game vs. the Dallas Blackhawks. My dad found the team bus after the game and suggested I wait there to get autographs. Stan was as nice as could be signing for everyone who asked. As always, Stan was wearing a loud plaid sport coat, blue pants and light blue suade shoes. Some images are seared into your memory. I still have that single page program. He provided a lifetime of memories for a kid from Michigan and millions of others, too. RIP, Stosh, and thank you for making growing up a Hawks and hockey fan so special. ← What To Make Of Chicago’s Next Generation?